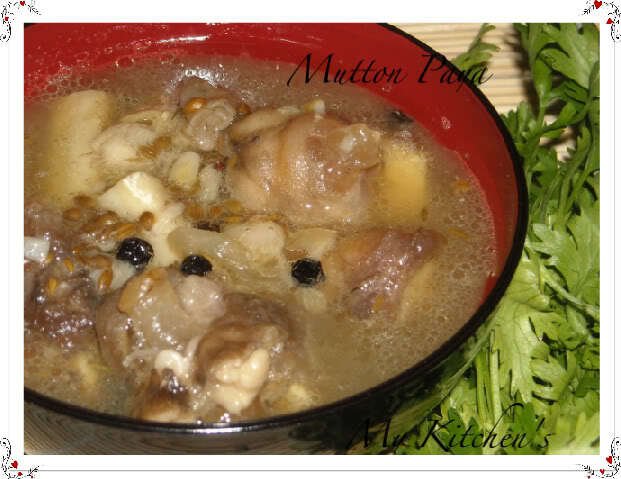 Lamb trotters are the lamb legs and they are burnt before selling.The trotters has to be cleaned and small strands of hair has to be removed.This is soup is very healthy mostly given to children, to the new mothers and also to recuperating patients for its nourishments. This soup i remember my mom used to give me as i was very thin and she used to say that this soup is very healthy for the kids.My kids also love this,i usually make this as their breakfast on holidays. 1.Clean mutton legs throughly and check it for small hair which has to be removed. 2.Mix trotters,onions,garlic,black pepper, coriander, zeera, chillies and oil.Pressure cook until you get 5-6 whistles. 3.Allow it to cool and add salt,again pressure cook until you get 2-3 whistles. Before giving it to kids filter the soup and let it be warm.This taste good with hot dosa. PS:- Remember to add salt after step two not before that because if salt is added intially the trotters takes time to cook. I have been awarded and tagged by the lovely and talented ladies Uma,Padma, Sree,EC, Ramya, Suparna, Kalyani, Rajji .Thanks a lot friends and please forgive me for doing this tag very late as i took a small break from blogging and did much of my pending work,like finishing my half done painting,did some snacks for my kids,crochet and completed Daughters Of Arabia book. Friends please excuse me if have missed anyone,i am very sorry. 6. What do you think about the person (ladies) who tagged you? All are talented,innovative and sweet. Hyderabad in particular where i have spend my childhood. 14. What is your favourite piece of clothing in your own closet? 20. Describe your personal style.? 25. What do you do when you “have nothing to wear” (even though your closet’s packed)? 27. What do you do when you are feeling low or terribly depressed? 28. What is the meaning of your name? 29. Which other blogs you love visiting? I love all the blogs. **The rules are: Respond and rework – answer the questions on your own blog, replace one question that you dislike with a question of your own invention, and add one more question of your own. Then tag eight or ten other people. Leave a comment on which of the blogs to let them know they have been nominated. Hugs to you all and thanks for making my blog what it is now. Soup looks awesome and congrats on ur well deserved award dear..keep going. Wow the soup looks so delicious! And that was an interesting read! Very healthy soup and nice click Saritha .Congrats on your awards and nice to know more about you dear. yes dear i am living here . wat a healthy soup!i don't like to cook mutton. Congrats on ur awards...u r a lovely person! Wishing u to get more&more awards! Very healthy soup.Looks yummy. Congrats on your award. Cool so meet me soon okie? Hope am your blog frd too ;)..love reading you meme and paya looks gud..
Thanx priti ofcourse ur my blog friend, when and where can we meet??? Wow paya looks delicious Saritha..;Congrats on ur award and nice to know more about u dear..
Nice to know more about you Saritha. 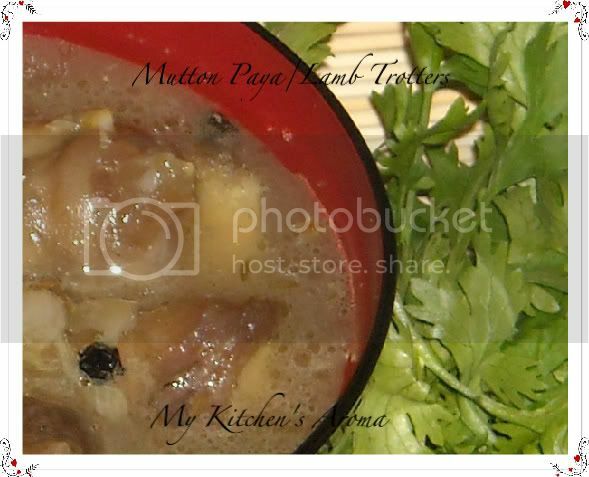 Mutton paya looks delicious... it is my hubby's all time favourite. Congrats on u'r award varunavi..Nice reading abt u!! Soup looks awesome! Congrats and so nice to know about you! Great soup, never made it but I've had it a couple of times and I love the flavour. That looks delicious. For how many days i can preserve this soup in refrigerator and how can i do it? This is best taken fresh. Never refrigerated it, so no idea.